Two men have been arrested in connection with the death of a father-of-two who was shot while waiting for his son outside a Belfast school. 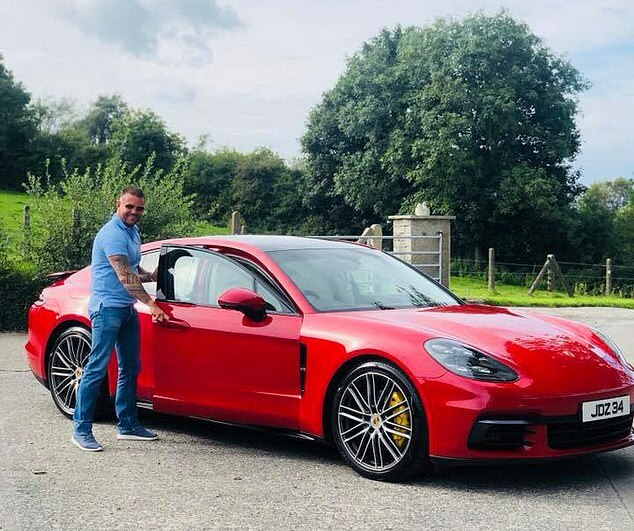 Jim Donegan, aged in his forties, was sitting in his luxury Porsche car when he was targeted in the gangland-style near St Mary’s Grammar School in West Belfast. 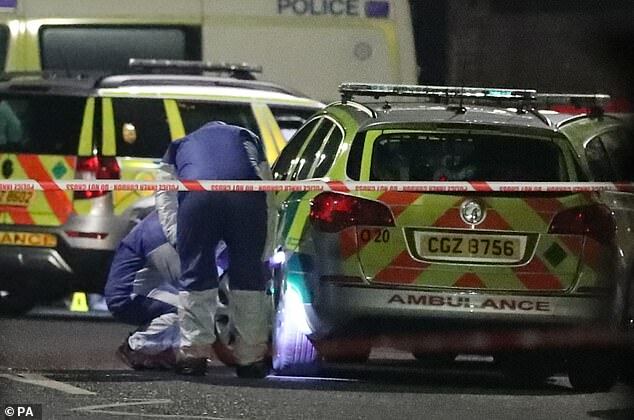 The victim had pulled up in his £80,000 2017 Porsche Panamera when the gunman opened fire. The Police Service of Northern Ireland said two men, aged 49 and 51, were detained on Wednesday evening following a number of searches in the west Belfast area and they remain in custody. 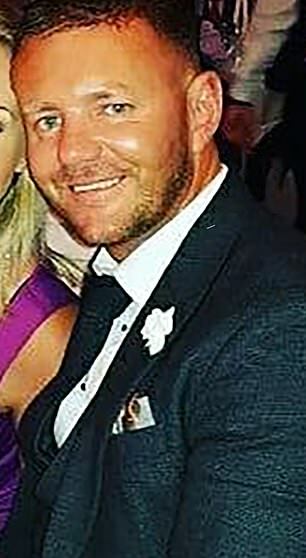 Mr Donegan, a married father-of-two, was shot several times, was hit in the head and died at the scene, police confirmed. 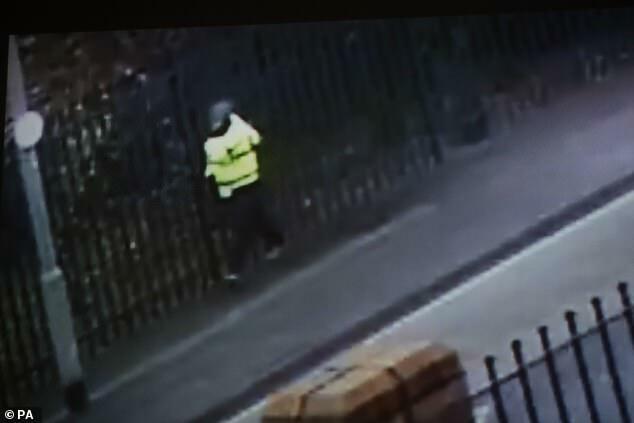 CCTV shows a man in a high-visibility coat walking near a school in west Belfast, before later fleeing. Police Service of Northern Ireland (PSNI) Detective Chief Inspector Pete Montgomery said: ‘Children who moments before were no doubt enjoying Christmas activities in class, maybe practising for their Christmas concert or school nativity, will no longer be dreaming about Santa or presents. ‘Instead they will be having nightmares about a murder in broad daylight outside their school. A place which should be a safe haven to learn and grow. ‘The gunman walked past these children and fired a weapon eight times. 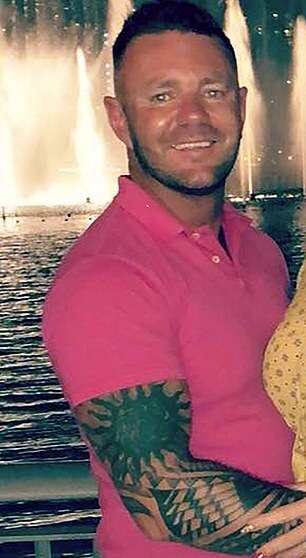 Local reports claim his death may be linked to an ongoing feud between two crime families. Mr Donegan, who owned a haulage business, was known to have associates and business links to the Republic. St Mary’s Grammar School in west Belfast is closed today and pupils will be offered counselling. 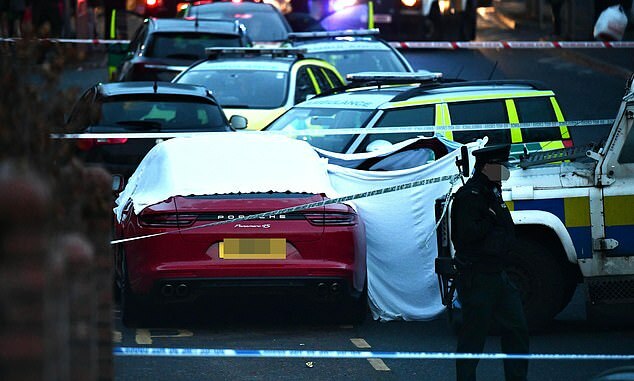 Last night the victim’s Porsche was covered in a tarpaulin and forensics officers combed the area for clues. St Mary’s issued a statement on Tuesday evening saying it will be closed on Wednesday. ‘The thoughts and prayers of the Principal and all the staff are with our pupil and his family at this very sad time,’ the school’s statement said. ‘Ensuring that all pupils got home safely was our absolute focus following this tragic incident. The Northern Ireland Ambulance Service (NIAS) attended but transported nobody from the scene, a statement said. 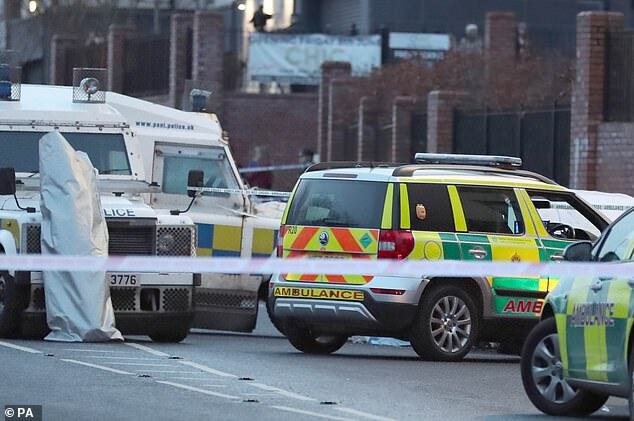 The Police Service of Northern Ireland (PSNI) confirmed an incident had occurred and closed a number of roads nearby. Detective Chief Inspector Peter Montgomery said yesterday: ‘Police are currently at the scene of a shooting during which a man died. 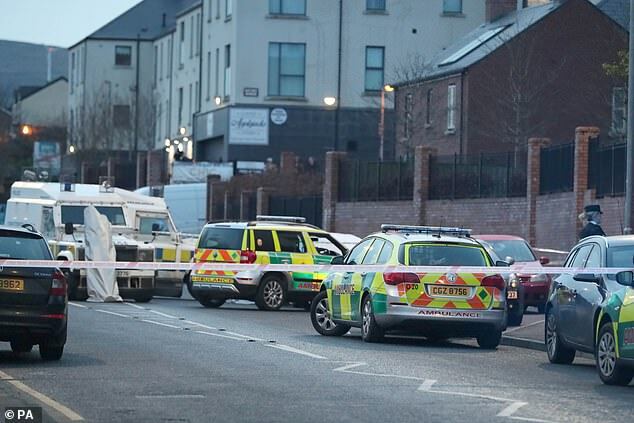 An NIAS statement said: ‘The Northern Ireland Ambulance Service received a 999 call at 15:14 on Tuesday 04 December 2018 following reports of an incident in the Glen Road area of Belfast. ‘Two paramedic officers and one rapid response paramedic were dispatched to the incident. Tim Attwood, an SDLP councillor, claimed the victim of the shooting was killed ‘instantly’. ‘It is absolutely sickening that a gun was fired in the vicinity of both a primary and secondary school in west Belfast today,’ he said. 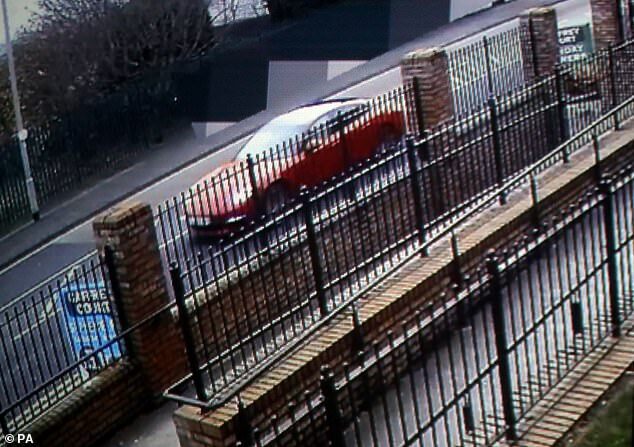 ‘A number of pupils witnessed this fatality and are understandably very disturbed and frightened after this reckless act occurred nearby the school gates. ‘There is absolutely no place for this in 2018; this madness belongs in the past and we cannot allow it to once again become our normality. The Glen Road, usually a busy thoroughfare, was dominated by cordons, police land rovers and flashing lights. Some children were unable to make their way up the road and received assistance from youth workers. The area includes two post-primary schools and nursery schools. A tall metal curtain has been erected to block a view of the scene of the shooting. Transport operator Translink said its services had been diverted. 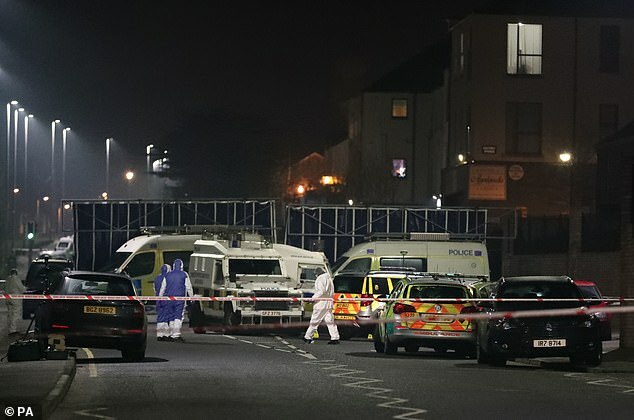 Paramilitary-style shootings are still a regular occurrence in Northern Ireland, 20 years after the Good Friday Agreement which largely ended violence, although most are not fatal. Detectives have not yet commented on any potential motives for the attack or who may be responsible.